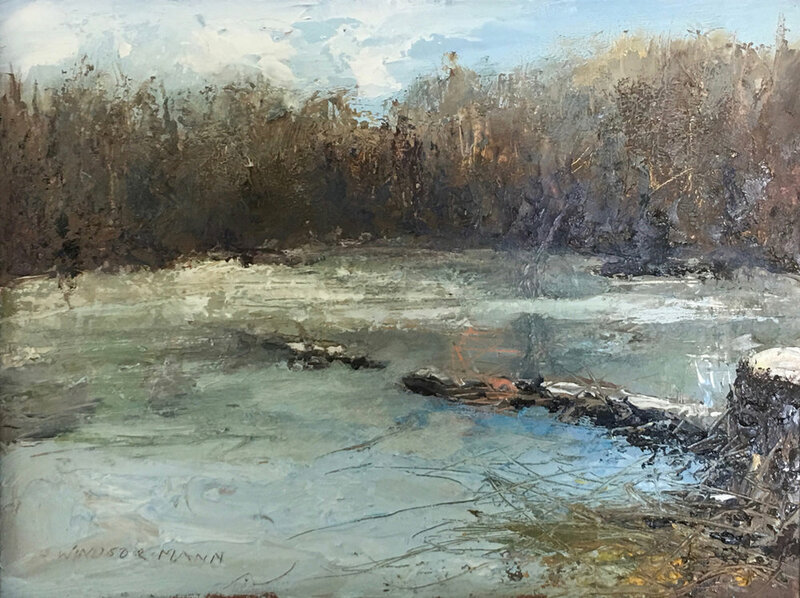 A native of Knoxville, Tennessee, Ruthie Windsor-Mann has lived and painted in Linville, North Carolina for a number of years and has lived in Washington, Virginia since 2010. Ruthie has traveled and painted in many countries throughout the world. Before moving to Rappahannock County, Ruthie’s favorite subjects were European buildings. More recently she has become enamored of nature surrounding her studio off Tiger Valley Road, however, she is inspired in painting anything if the light is intriguing. She works primarily in oils, watercolors, pen and ink along with egg tempera on icons. In the past, she has worked in intaglio. Having received her B.S. and M.S. degrees from the University of Tennessee, Ruthie has been a professional artist since 1970. Her past and present juried signature memberships include the Rocky Mountain National Watermedia Society, Tennessee Watercolor Society, and Southern Watercolor Society. One year she was the only artist in the nation to have all 3 submitted paintings chosen for exhibition in the Rocky Mountain National Watermedia Exhibition. She has received many individual awards in juried exhibitions throughout the United States and has participated in numerous one-woman and group shows. She was a guest artist at the 1982 World's Fair. Occasionally, Ruthie will teach a workshop, but her primary interest is in producing art. "One of the most outstanding artists ever produced in the area." "Exceptionally strong technique; effective; decisive; good source of color and light." "Marvelous use of light and shadow, and a delicate blend of real and dreamlike qualities."